Nice bright light, looks like it would be a bit more sturdy and made of better materials but nonetheless good light. It is an integrated led so don’t forget it does not take actual bulbs! This 24-inch LED linear bath/vanity bar features a brushed nickel finish that will complement many transitional decors. The white acrylic diffuser softens the light creating an inviting atmosphere and completes this simple yet functional design. 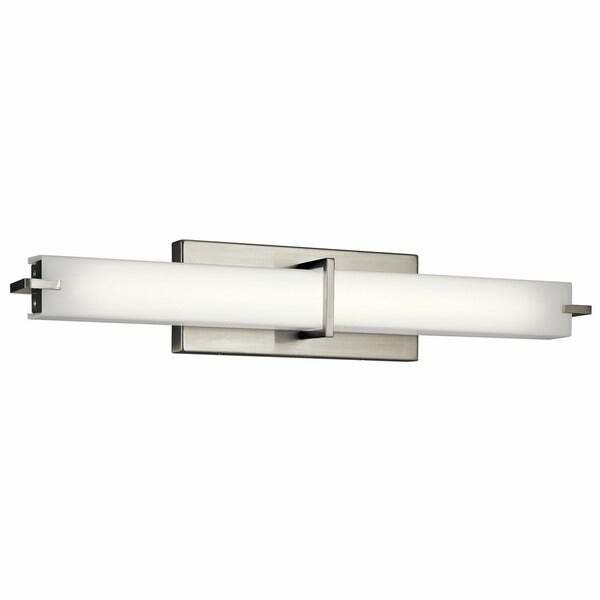 This LED linear wall fixture is a versatile piece. The brushed nickel finish and a white acrylic diffuser create a crisp look and bright, clean ambiance. Horizontal or vertical mounting options add to the versatility of this fixture. Dimensions: 4.75 inches high x 25.75 inches wide x 4.25 inches deep. Turn on our fixtures, and watch your room transform even more. From lighting to ceiling fans Kichler collections are built around our simple philosophy of bringing you the effect you want for your home or business. Our collections coordinate from room-to-room, or let you mix and match from wall-to-ceiling. And each fixture is designed to deliver a stunning quality of light that makes your space more beautiful and more livable. As one of the largest, privately held residential lighting fixture companies in North America, we're constantly working to create innovative and on-trend decorative products as well as knowledgeable support. Since 1938, we've been creating products that are not only well designed, but also practical. We invest millions of dollars each year in design, technology and testing to assure that we're offering distributors, designers, installers and homeowners not only innovative technologies - but also fixtures that perform efficiently, install intuitively and deliver a premium source of light. This philosophy holds true for everything we create - from our wide variety of decorative fixtures to our award-winning landscape lighting to our ceiling fans. I positioned these (4) lights vertically, one on each side of the frameless mirrors above the two bathroom vanity sinks. They are spectacular! We also have them on a dimmer switch, which offers from a soft light to a makeup ‘bright’ white light! Love them! Nice Bright LED. Installed in powder room. "What is the light color temperature?" This can be installed vertically or horizontally and is dimmable. "dimmable? sample of compatible dimmers?" "Is there a Kelvin rating for this fixture?can you tell me what it is? Does this change if you use more than one fixture?"